Handmade Breakfast at Tiffany's Eyelashes Sleep Mask Tassel Ear Plugs Set Bachelorette Party Mask. 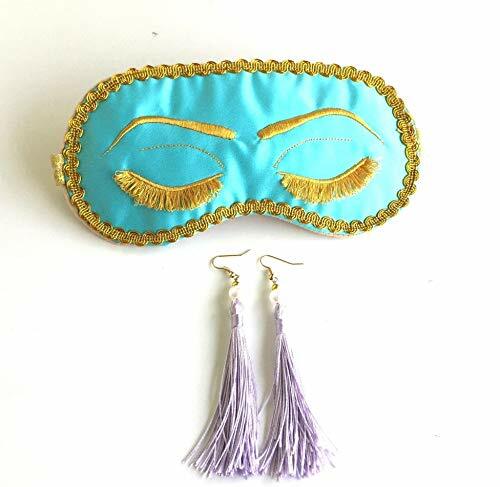 This eyelashes sleep mask and tassel earrings set is inspired by Holly Golightly in Breakfast at Tiffany's. The embroidered eyelashes sleep mask allows completely freedom to open and shut eyes, while keeping the wearer comfortable inside a curtain of darkness. The sleep masks are padded with polyester padding and the back is super soft and comfortable gold fleece. Light and slim, you will hardly know you are wearing it. The gold straps is sized to accommodate heads of all sizes. This eye mask is great party favor for slumber parties, sleepovers, girls night out or bachelorette parties. Measurements: Width (side to side) at the longest point: 7.25 inch Height (top to bottom) at the tallest point: 3.5 inch. Please contact me should you have any questions or would like to request a custom order. Our sleep masks are 100% handmade in my pet free and smoke free studio here in Michigan. If you have any questions about this product by ShushBear, contact us by completing and submitting the form below. If you are looking for a specif part number, please include it with your message.